SG Tanks is highly experienced in supplying and installing high quality plastic and steel oil tanks. The main goal of our company is to exceed our customer expectations by offering a customer service focus which allows us to offer you the very best solutions. We are interested in your feedback on our service and the oil tank installation, as our success then becomes an effective strategy for our growth expansion in the local area for Hampshire, Surrey and Sussex. With over 25 years of experience, SG Tanks have developed a superb reputation throughout the local area delivering installation services for single skinned oil tanks, double skinned bunded oil tanks, metal oil tanks and much more. All services are to the very highest of standards and OFTEC regulation. We provide a “complete” service giving you the customer, complete peace of mind about your tank installation. We have also just started sending clients courtesy letters by post every six months to inform you of new services we are adding as a company to help and support your tank installation. Don’t forget that we also offer free estimates and 24 hour emergency callouts. Our staff are ready to assist. As a company we are very environmentally aware, and we do everything we can to offset our carbon footprint with every tank installation. We endeavour to offer every client a quality service on every job. 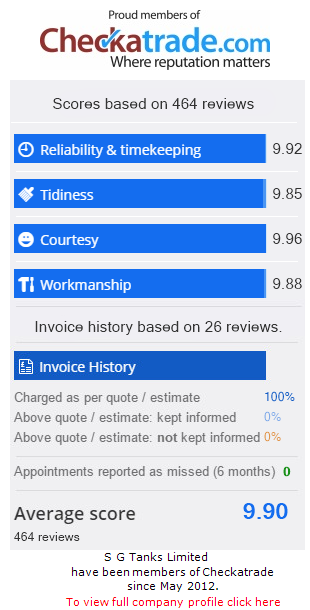 Our clients always give us great feedback on every installation through checkatrade, and our overall scores are always very good. Our customer service focus is second to none and we always do everything we can to help and assist. If you are interested in having a tank installed on either a domestic, agricultural or industrial property, our team can help you. Contact us today by calling 01903 856403 or emailing salessgtanks@gmail.com. Sean started the company in early 2004 after working for various oil tank companies including Metcraft Tanks Ltd in Littlehampton. His skills and expertise have seen the company grow into what it is today, as it continues to develop in Hampshire, Sussex, Surrey and beyond. Mark joined the company in 2008 as a welder and has progressed very quickly to become an installer with OFTEC accreditations, as such he is a highly skilled oil technician and experienced member of the team who always puts the customer first and is praised on his professionalism. Daniel is the newest member of the team and enjoys the whole ethos of what the company does. He is very bright, enthusiastic and does a fantastic job. He knows all aspects of company operations and has a superb knowledge of the industry, allowing him to be totally technically efficient.